Welcome to the new Oxford Francis Bacon website. 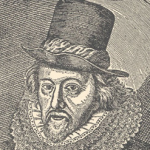 Here you will find information about our project to complete a 16-volume critical edition of the works of Francis Bacon (1561-1626), the Elizabethan-Jacobean lawyer, natural philosopher, and statesman. The Oxford Francis Bacon project aims to produce a new 16-volume critical edition of the works of Francis Bacon (1561–1626), the Elizabethan-Jacobean lawyer, natural philosopher, and statesman. It aims therefore to replace the great but now outdated Victorian edition produced by Spedding, Ellis and Heath, and for the first time to publish a number of manuscript works unknown to them. In the process we hope to improve and advance critical-editorial techniques at the very highest level; provide brand-new facing-page translations for the edited texts of the Latin works; and reintegrate Bacon’s work into the study of early modern philosophy, science, historiography, legal thought, and literature. Originally the brainchild of the late Professor Graham Rees, the project now belongs to the British Academy’s portfolio and the work is being carried out by an international team of scholars supported by an advisory board chaired by Professors Richard Serjeantson and Alan Stewart. So far eight volumes have been published – four of which comprise Graham Rees’s revolutionary editions of Bacon’s Latin philosophical writings – and work is proceeding apace on the others. In sum, we aim to transform our knowledge of the Baconian corpus in new and exciting ways that speak to students and scholars across all relevant disciplines. 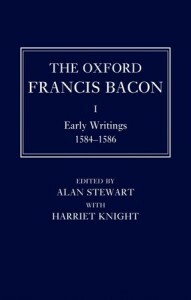 The Oxford Francis Bacon I: Early Writings 1584-1596, ed. by Alan Stewart with Harriet Knight (Oxford University Press, 2012), pp. 1,136. ISBN: 978-0-19-818313-6. “It was during these years of frustrated ambition and conflicting objectives that Bacon composed the works contained in the collection edited by Alan Stewart with Harriet Knight. 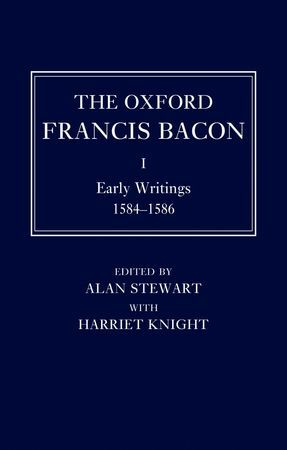 The Oxford Francis Bacon is a major scholarly project conceived by the late Graham Rees and administered nowadays by an editorial advisory board of 16 experts under the direction of Brian Vickers, the leading Baconian scholar. Early Writings 1584-96 is the seventh volume to be published and there will be 15 altogether. “One of the most fundamental and obvious reminders offered by Alan Stewart’s edition of Bacon’s early writings is that his work took the form of writing. It can prove dangerous to describe this writing with reference to such anachronistic terms as ‘objectivity’, but the Oxford Francis Bacon I reminds us that Bacon’s significance for the history of science may lie as much in the way in which he wrote as in what he wrote.